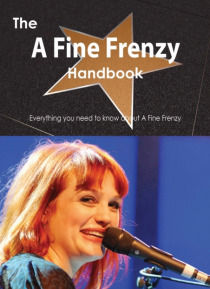 Alison Sudol (born December 23, 1984), known professionally as A Fine Frenzy, is an American alternative singer-songwriter, pianist, and Goodwill Ambassador for the International Union for Conservation of Nature (IUCN). Her debut album, One Cell in the Sea, was released in 2007, followed in 2009 by Bomb in a Birdcage. Sudol's songs have charted in the United States, Germany, Austria, Switzerland, … Poland, and France, among other countries. Her music has also been featured on numerous television shows and featured in several major motion pictures. A Fine Frenzy's latest album, Pines, was released on October 9, 2012. This book is your ultimate resource for A Fine Frenzy. Here you will find the most up-to-date information, photos, and much more. In easy to read chapters, with extensive references and links to get you to know all there is to know about A Fine Frenzy's Early life, Career and Personal life right away. A quick look inside: A Fine Frenzy, Almost Lover, Bomb in a Birdcage, Doppelgangers (How I Met Your Mother), Jason Flom, Oh Blue Christmas, Pines (album), Sleepwalking (film), Stockings by the Fire, Virgin Records 29and more pages!Contains selected content from the highest rated entries, typeset, printed and shipped, combining the advantages of up-to-date and in-depth knowledge with the convenience of printed books. A portion of the proceeds of each book will be donated to the Wikimedia Foundation to support their mission.